It’s ubiquitous. Find any group of modern, even slightly tech-savvy women—especially those that need to stay connected while miles apart—and, chances are, you will also find a group chat. Sometimes funny, sometimes sad, it’s a consistent emblem of the 21st century girl gang, and one that happened to send a group of Pennsylvania State House candidates into a stream of giggles. I first heard about Elizabeth Fiedler, Sara Innamorato, and Summer Lee right after they all won their primaries; The New Yorker painted these three first-time progressive candidates as women to know—they’re all endorsed by the Democratic Socialists of America—explaining that through their campaigns they became fast friends, bonding over their similar platforms and shared experiences. But the truth is that they’re not lame—they’re busy. They’ve been campaigning around the clock trying to get to Harrisburg—and it’s working. 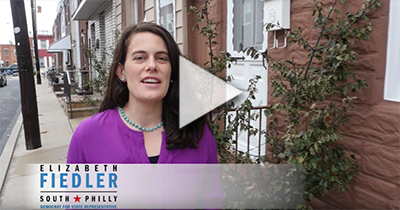 Fiedler, who’s running for House District 184 in South Philadelphia, announced she was running in September, only a few months after she left her job as a reporter for an NPR station. She has two sons under the age of four (hence the group chat photos). Innamorato, who’s running for House District 21 on the other side of the state, grew up in the district and lost her father, who was addicted to opioids, in her early 20s. She went on be a co-founder of She Runs Southwestern PA, which encourages women to run for office, and then ended up running herself. The three first met back in February at the Keystone Progress Summit where they were on a panel together and held a joint fundraiser—but they knew about each other before then. Their strategies proved successful; The New Yorker reported that more than 30 percent of voters showed up for their races, as opposed to the typical 18 percent. When talking about their tactics, they all repeat similar messages: They knocked on tens of thousands of doors. They kept their message consistent, from white affluent suburbs to poorer, disinvested communities. They didn’t write anyone off and talked to everyone they could. And in a year when women are continuing to win primaries across the country, their victories are representative of a larger trend. According to the Center for American Women and Politics at Rutgers University, Pennsylvania only had six women running for congressional or statewide office in 2016; this year there are 26 women running and 21 are Democrats.